World 4-3 is the third level of World 4 in New Super Mario Bros.. This level takes place underwater, and it contains several Unagi and Mega Unagi. The player begins the level by entering a Warp Pipe to go underwater. 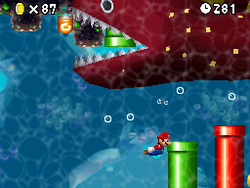 Once Mario is underwater, the level begins auto-scrolling. The player must maneuver through the water while avoiding the Unagi and Mega Unagi. The first Star Coin is in a little crevice about a quarter into the level. After the coin is a Red Ring. The second Star Coin is found about halfway into the level between two Unagi. If the player presses the ? Switch and then goes into the green pipe that is next to the yellow pipe, they can find the final Star Coin. After going through the Pipe at the end of the area, Mario reaches the Goal Pole. Star Coin 1 - After the first Mega Unagi passes, the player should swim to the right and drop down and left to go under a rock formation where they can get the coin. If the player is not fast enough, Mario is crushed between the scrolling screen and rock. Star Coin 2 - The second Star Coin is located at the bottom of the level between two rock formations, where it is guarded by two Unagi. Star Coin 3 - After hitting the ? Switch, the player should enter the lower right green pipe to be transported to an area with two Unagi and a red pipe spewing bubbles. The player should immediately swim over the left of the cave, go down past the Unagi and use the bubbles to collect the final Star Coin. This page was last edited on April 6, 2019, at 01:33.